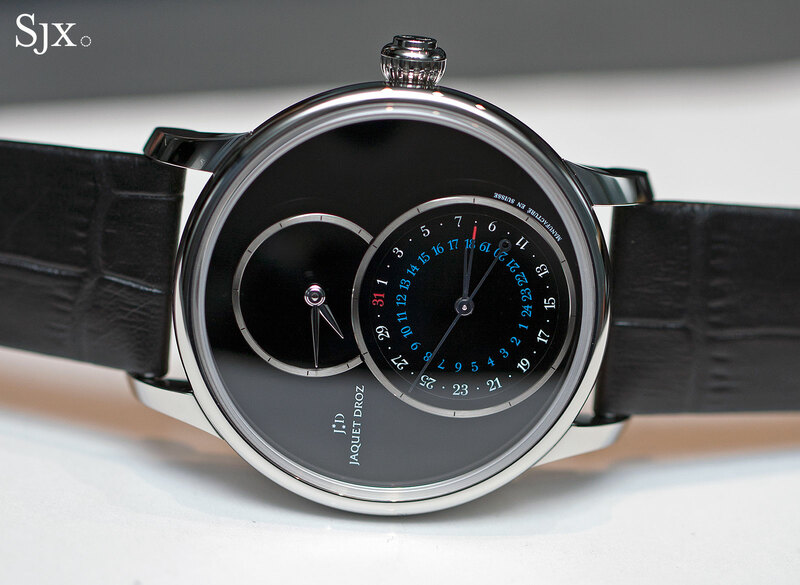 Jaquet Droz gives its signature wristwatch added functionality with a date and second time zone. A second time zone and date have been seamlessly integrated into the dial of the Grande Seconde, a watch that’s synonymous with Jaquet Droz and available in a bewildering array of variations, from the entry-level steel and onyx model to the gorgeous paillonnée enamel limited edition. 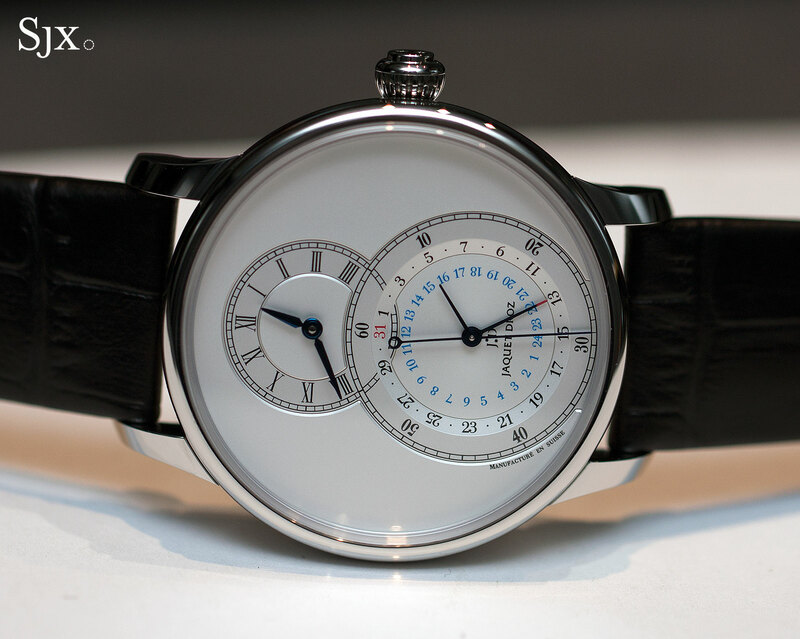 Based on a 19th century Jaquet Droz pocket watch, the Grande Seconde is characterised by an oversized seconds sub-dial. 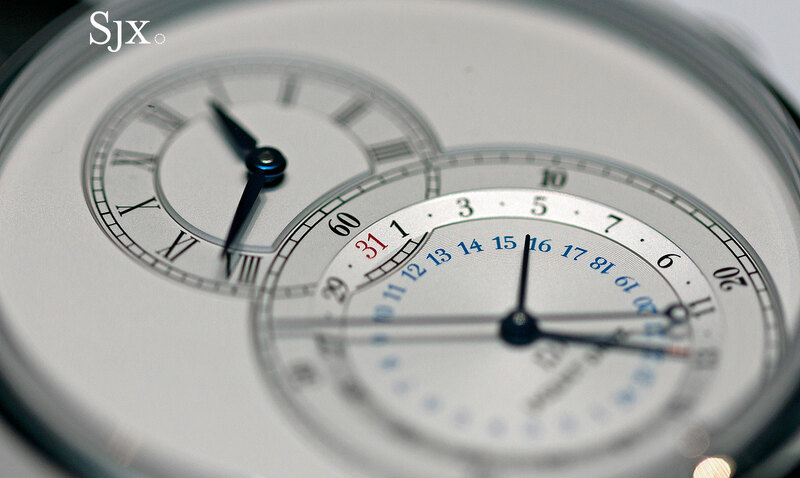 That leaves space for three scales on the sub-seconds, the innermost being the second time zone 24-hour scale in blue, followed by the date (from “1” to “31”), and then the seconds. 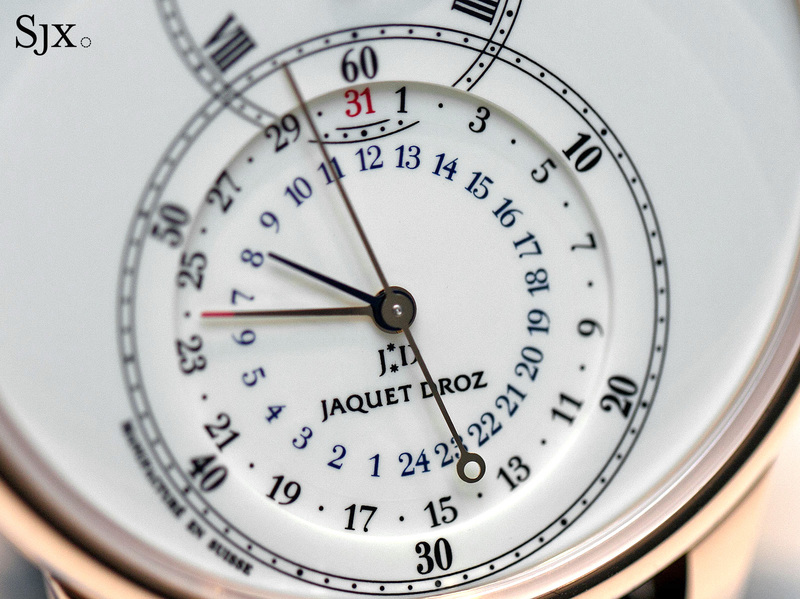 To differentiate between the three hands on the sub-dial, the pointer for the date is tipped in red. Conveniently, both the date and second time zone can be set via the crown. Though there’s a lot of information on the sub-dial, the real estate devoted to it is sufficient. The scales are distinct and legible, though the small size of the individual numbers mean it can take a moment to read the second time zone. The watch is powered by the automatic calibre 2663H24 that features a silicon hairspring and pallet fork, common to most Jaquet Droz watches. Originally based on the Frederic Piguet 1150, the calibre is distinguished by its twin barrels and longish 65-hour power reserve. 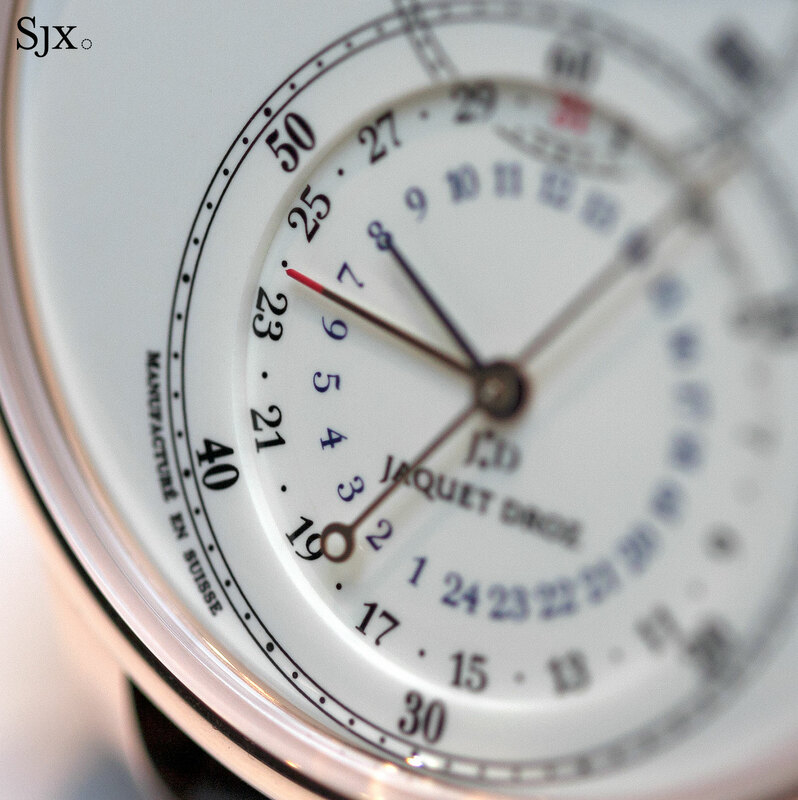 Like most other Jaquet Droz men’s watches, the case is a large 43mm in diameter. It’s a simple form from the front, but with an unusual profile: the case flanks rise outwards towards the bezel, meaning the case back has a smaller footprint than the bezel. 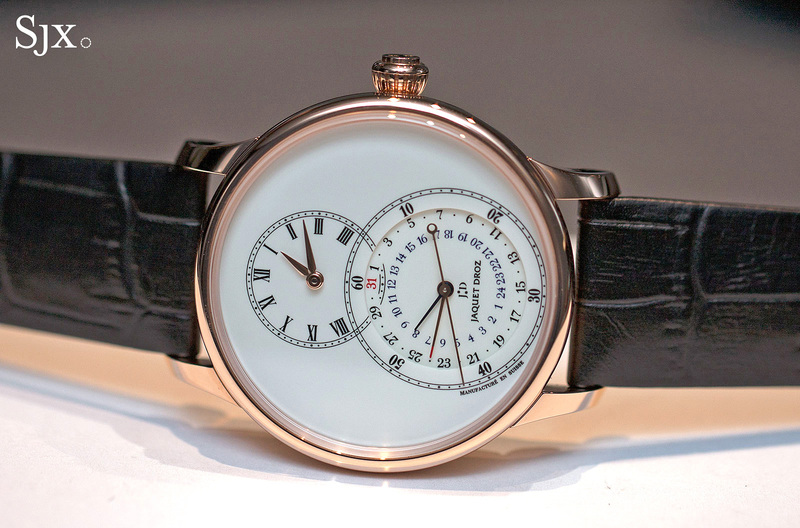 Three versions of the Grande Seconde Dual Time are available, two in steel and one in rose gold. All share the exact same functions and dial layout, but the dial details and materials differ. The top of the line gold version has a two-piece vitreous enamel dial (often called grand feu enamel); the sub-dial is a separate piece that sits below the level of the main dial. 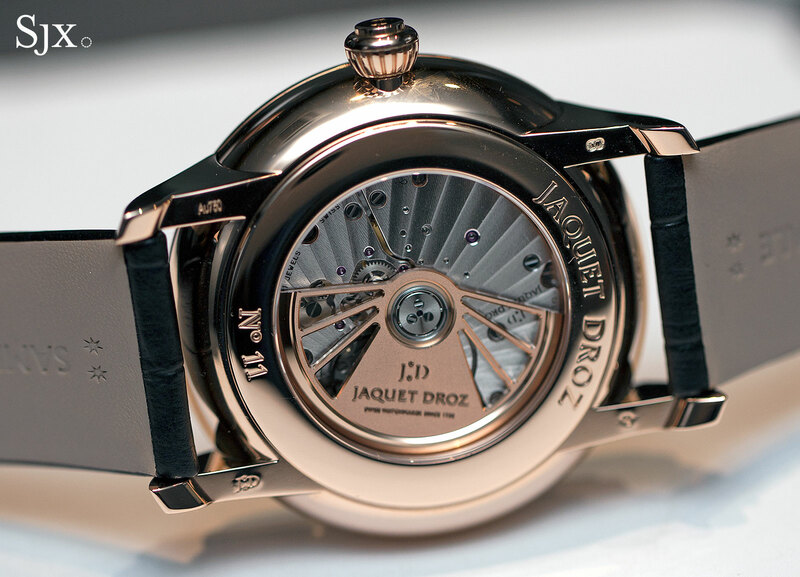 Also unique to the gold model is the 18k rose gold rotor; the steel versions have brass rotors. The steel model is available with a silvered dial featuring countersunk sub-dials – this is most affordable version of the Grande Seconde Dual Time. The second stainless steel version has a black onyx dial. Extremely black and glossy, the onyx dial has applied 18k white gold rings to mark the sub-dials, giving it the cleanest and most modern look of the three. The Grande Seconde Dual Time starts at US$16,000 or S$26,000 for the steel and opaline version (ref. J016030240), while the steel and onyx (ref. J016030270) is US$17,500 or S$28,000. The rose gold model with enamel dial (ref. J016033200) is US$26,800 or S$43,000. 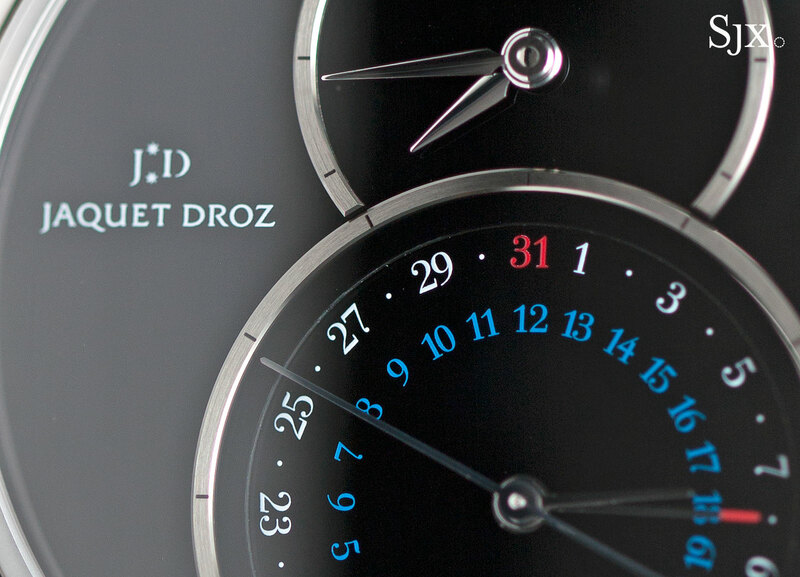 They are available from Jaquet Droz retailers and boutiques. The emblematic Jaquet Droz Grande Seconde will soon be available in a more affordable guise with the introduction of a stainless steel model at Baselworld 2016. Here's a quick rundown, including the price. Jaquet Droz has taken its signature Grande Seconde wristwatch and given it a deadbeat seconds, along with a date display; and the dial is grand feu enamel.